I must confess, the Me-Made-May'12 challenge proved to be just that - a challenge! Several days each week I did wear something I made. The other days? I either completely forgot, or was just in the mood to wear something else. And some of the days when I did wear something I made, I forgot to photograph my ensemble. So there you have it. 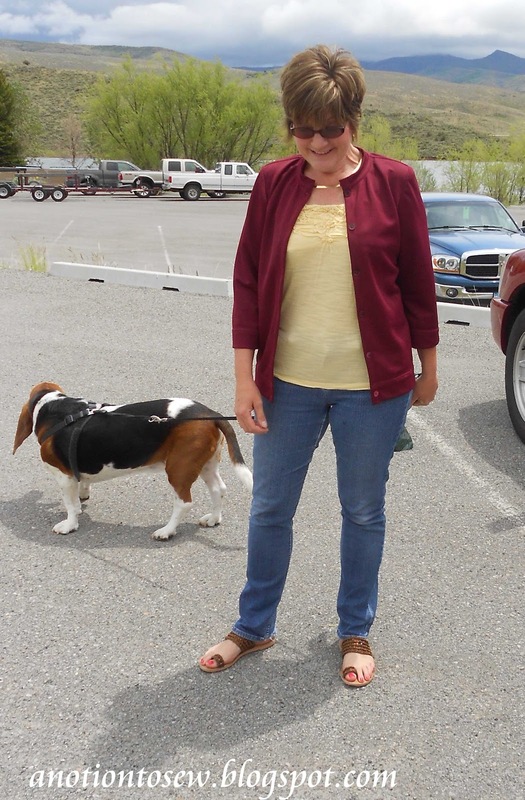 We are at the end of May, I did not make the challenge, but I did learn something from it: I have some items that I tend to wear over and over, while some of my other items sit idle in the closet either forgotten or ignored. I have beutiful garments that I put a lot of time into constructing and I need to make a conscious effort to ensure they get their due time on the runway. I guess it is no different from my RTW clothing. I have some items I wear over and over while others sit idle. Perhaps I need to clean out my closet. Right now I am piecing together a few quilt squares for a bed runner, I have a Vogue top on my cutting table, and I have a baby gift in queue. Hopefully the remainder of this week I will be productive. You did a great job, even if you didn't wear every day something you made. The important thing is take part in the challenge and think about what we have done, what we wear more, and less, and what we need to sew the next time. Yes, it was a learning lesson. Thanks for the kind comments Ana. Congrats on making it through the month! It sounds like it proved successful for you since the important part is learning how your wardrobe works or doesn't work for you. Well done!